Now here is a book title designed for just this very moment. Wool. Quilts. Wood fires. Hibernating. Mmmmm. 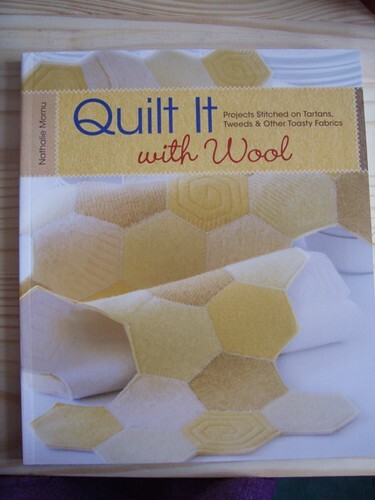 Quilt it with Wool by Lark Book is about to come out in the US and in the UK in March and among the many excellent projects, there is one by me. Although having said all that about wool and winter, mine is decidedly spring-like in mid-pink lambswool. There are a lot more snuggly-type things in there as well. I designed a large purse / zipped bag made from a recycled lambswool jumper – the fine-knit M&S type that don’t felt. The stretchyness of the knit is perfect for trapunto quilting. Trapunto is a favourite technique of mine where you stitch the design through two layers then cut the backing to stuff the outline shapes. The stretch in the wool makes it take the stuffing really well and create a strong, raised textured surface. 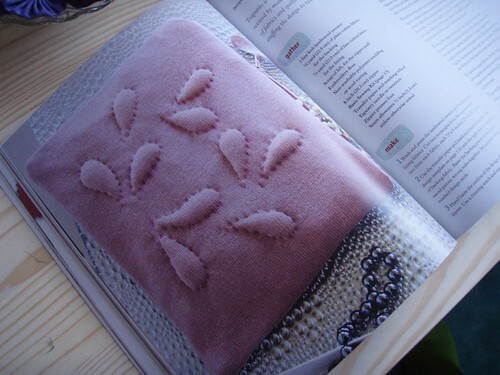 I tend to use hand stitching rather than machine because I’m a craft Luddite and I love the effect of hand stitching. 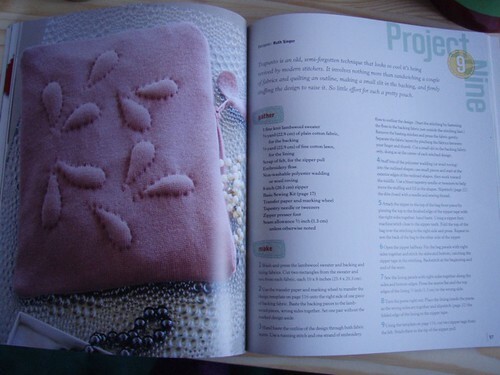 The design I used is a very simplified leaf wreath with the shape echoed in the little wool tag on the zip. Love doing fun things with zip tags. I’ve got several projects in books coming out in 2010 so am eagerly awaiting copies appearing in my post box. I like that idea a lot. Never thought of mixing wool and sewing. hmmmm……. wanders off to ponder her stash and her sewing machine. Yes. I love the ideal too, so cute!